With the best meat selection in town, Grand Central Foods provides the highest grades of beef, pork and poultry at an affordable price. Our meat is fresh and always the best. Star Ranch U.S.D.A. Choice Black Angus Beef, Hormel, Tyson and Smart Chicken are a few of the top brands we are proud to offer. 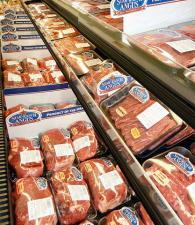 Our meat cutters are known for their expertise and are happy to assist you. We are never too busy to make special cuts just for you at no extra charge. Do you like a thick juicy steak? Or are you partial to a lean fillet? Let us know and we’ll cut your meat to your specifications. Feel free to ask us for dinner suggestions and don’t forget to pair your meal with the perfect bottle of wine. If you are not sure what wine goes with your meat selection check out our wine pairing tutorial and learn today. If you have any questions or would like to place an order, please ask one of our friendly meat department experts or call us at 362.5527.